The Food Bank began in 1988 with one man, a van and one small room. Today the Food Bank is the backbone for Westchester’s emergency food distribution network and they acquire, warehouse and distribute food to over 265 front-line hunger-relief programs throughout the county. 95% of all the food they provide is part of front-line programs that feed Westchester children, seniors and their families who are hungry or who are at the risk of hunger. Overall, the Food Bank distributes about 14 tons of food a day! 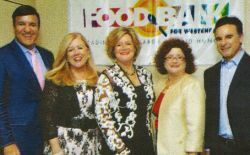 Scott Boilen at a recent gala honoring the Food Bank for Westchester’s fight against hunger for the past 25 years. This entry was posted in Scott Boilen in the News and tagged charity organization, NY food bank, Scott Boilen, Westchester Food Bank on October 30, 2014 by ScottBoilen. It is nice to see someone giving back, thank you!